Vanderbilt easily beat overmatched rival Tennessee twice already this year, but the Commodores came up short in their third meeting in the SEC tournament on Thursday. The inexcusable loss will leave Vandy sweating out Selection Sunday. NASHVILLE, Tenn. — The question was a fair one, but it still seemed to catch Damian Jones off guard. As Vanderbilt’s senior forward sat high atop a podium after his team’s opening game of the SEC tournament, he paused. An onlooker had posed a relatively black-and-white query to Jones: Do you feel like you’re still in? Jones, of course, was referring to Vanderbilt’s hopes of making the NCAA tournament, a feat once considered a foregone conclusion for such a talented roster. But the unforgiving reality of conference tournaments reared its head at the Commodores in Nashville’s Bridgestone Arena on Thursday. The result? An inexcusable, 67–65 second-round loss to 12th-seeded Tennessee, which ended Vanderbilt’s stint in the SEC tournament on the very day it began. Now the Commodores, who looked the part of an SEC title contender in the preseason, find themselves sweating ahead of Selection Sunday. Vanderbilt simply needed to avoid an embarrassing exit in the SEC tournament to remove doubt about its postseason plans. Instead, coach Kevin Stallings’s program laid a black-and-gold egg at the worst possible time, a performance that might end up spoiling Vanderbilt’s shot at the Big Dance. The Commodores had won six of their final eight regular-season games heading into Thursday, but they looked anything but hot in the early moments against Tennessee. 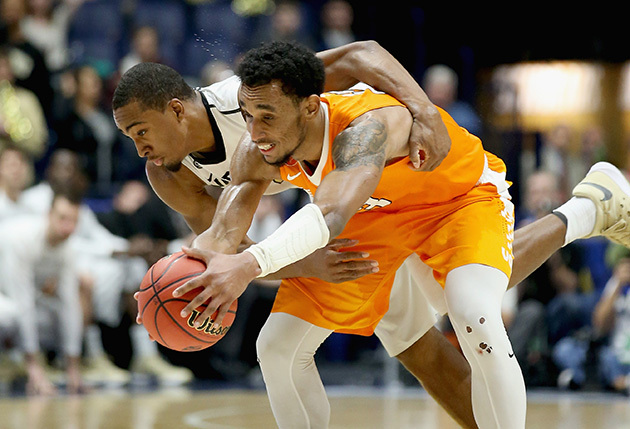 The Vols forced Vanderbilt into 10 first-half turnovers and led by as many as 15 points. UT had lost the in-state matchup twice this season by a combined 31 points, but it headed to the locker room with a 34–22 advantage at halftime. “I thought Tennessee really was aggressive in the first half, and I thought we played a little tentative early,” Stallings said. But Vanderbilt emerged from the locker room re-energized. Stallings and his staff threw a zone defense and a 2–1–2 press at Tennessee, which stalled the Vols’ offense. Meanwhile, the ‘Dores regained life, gradually chipping away at Tennessee’s lead. A three-pointer by Joe Toye with 4:19 to play gave Vanderbilt a 57–56 advantage, its first since leading 4–2 early in the first half. The Commodores were beginning to look the part of an SEC champion. Tennessee bounced back and led 67–65 when guard Detrick Mostella stepped up for a one-and-one opportunity with five seconds to play. When Mostella clanked the first shot, Commodores forward Luke Kornet hauled in the rebound and quickly dished to teammate Wade Baldwin. The senior sliced through a sea of orange jerseys and banked in a layup at the buzzer. Just like that, Vanderbilt was heading to overtime tied 67–67 with Tennessee. But poise had no business residing on Tennessee’s bench. Vanderbilt’s roster was tailor-made for poise, a deep and talented group built to wipe the floor with a rebuilding Vols squad. An undersized Tennessee team didn’t start a player taller than 6'7"—Vanderbilt’s lineup included two seven-footers in Kornet and Jones—yet the Vols matched the Commodores’ 30 points in the paint. Meanwhile, Barnes used just seven players in his team’s limited rotation, with one Volunteer, guard Shembari Phillips, notching just nine minutes. The deck was stacked against Tennessee, but Stallings and company inexcusably folded on a big stage. Now the Commodores have nothing left to do but wait, a feeling all too familiar to Vanderbilt fans. Since reaching the Sweet Sixteen under Stallings in 2007, the ‘Dores have turned several promising seasons into early March exits. Behind Jones, a potential NBA lottery pick, and big-time playmakers like Baldwin and Kornet, Vanderbilt entered this season expected to author another deep run into March. Instead the program often played down to its opponents, dropping games against non-tournament teams like Arkansas, Mississippi State and Ole Miss in SEC play. And unfortunately, it saved its worst SEC loss—to a sub-.500 Tennessee team—for last. The Commodores’ NCAA hopes have not totally vanished, of course. They finished the regular season on a 7–3 run (upping their overall record to 19–13 and SEC record to 11–7), with wins over Kentucky and Texas A&M during that stretch. Their strength of schedule (27th) and RPI (51) will still work to their advantage. But can the Vanderbilt team that failed to show up against Tennessee (15–18, 6–12) convince the selection committee of its tournament worth?